Sunderland are ready to make a big move in the Barclays Premier League ‘08/09 season and it’s all begun with the release of their new kits. Roy Keane’s bunch finished 15th last season, while some had them going down. What will they do for an encore in their second straight top-flight season? You can find out wearing one of these cool new Umbro jerseys. The Official Home Short Sleeved Soccer Jersey for England's Sunderland AFC from Umbro. The Black Cats are raring to improve on last season's record, but they'll need your support - and this is the jersey you need to cheer them on all the way to the top – whether you visit the Stadium of Light or cheer them on from your couch - It’s the traditional red/white stripes with a few updated touches and a sleeker look. 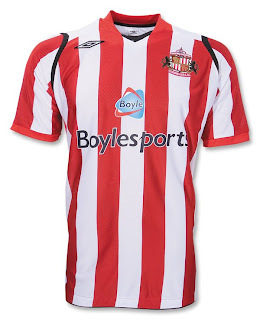 The Official Away Short Sleeved Soccer Jersey for England's Sunderland AFC from Umbro. 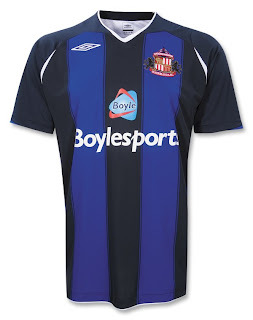 This new road jersey is cool dark midnight navy blue jersey with royal blue on front and white on collar and along bottom - When the Black Cats are away from the Stadium of Light for the Premier League '08/09 season, this is the jersey they'll be wearing. Of course, both team shirts feature the team crest embroidered over your heart with Umbro logo on upper right, with famous Boyles Sport logo on center; and it’s made with lightweight fabric and mesh for super comfort at the Stadium of Light or anywhere you cheer on Sunderland.